The Green Giant Arborvitae is more properly named by tree scientists the "Thuja Plicata," with the other common historic names being, "giant cedar," also "western cedar," and "red cedar." There's only one other Arborvitae specie in all of North America, the "eastern cedar," or "white cedar," with "Thuja Occidentalis," as the tree scientist's Latin name, the botanist's name. This short tree is actually what we usually think of when the "genus" juniper is mentioned. Funny that the eastern cedar was given the Latin name for "west" which is "occidental." You see? As I have observed before, what's in a name? Highland Hill Farm is not located in a town called Highland Hills, or, on Highland Hill Road, etc. Scottish Highland Hills cows that we grazed on our first property provided our company with a distinctive name when we sold our first trees in 1978.
what kind of plants you prefer and he will do the rest. Green Giant Arborvitae ranges naturally all across the United States from Massachusetts, southwesterly to Texas and New Mexico, through northern Arizona, up the Sierra Nevada Mountains to the state of Washington, and British Columbia beyond. What does arborvitae mean anyway? Now that we know about the derivation of "Green Giant," here's how the Latin name Arborvitae, or "tree of life," came about. As the first explorers of Canada were mapping the St. Lawrence River in 1536, the tree was used for medicine which saved their leader and most of the men too. Jacques Cartier explored the islands off eastern Canada, and then sailed westward where he entered the St. Lawrence River and found Quebec and a Royal Mountain (Mont Real, which is now called "Montreal"). Cartier was searching for the passage to China so many other explorers would also fail to find. Cartier and his men had to spend a long winter inside a little fort, away from the any sun, where they subsisted on meat, fish, and bread, eating no fruits or vegetables. As scurvy was killing most all of them, a friendly Huron Indian gave Cartier's crew tea made from the needles and bark of a tree which looked like the white cedars of Europe. So Cartier took some trees back to France with him, these Thuja Occidentalis Eastern White Cedars, naming them "Arborvitae," the tree of life. How about that? Arborvitae are native to the pacific northwest where they grow to 200 feet tall, usually 50 to 70 feet is the common height, even including here in Bucks county. Arborvitae do best in wet forests and swamps. The Green Giant appearance is due to this specie's wide 15-25 foot wide base, the slightly tapering conical shape, and the dense branches and leaves casting great dark shadows. The Arborvitae grows in zones 6 to 8, environments with temperatures that get as low as 10 degrees below 0 Fahrenheit, such as in Missouri or Pennsylvania, to environments where winter temperatures get only as low as 20 degrees above 0 Fahrenheit, such as mid-Texas and northern Florida. Green Giant Arborvitae have pretty, yet surprisingly tiny yellow flowers. The "pine cones," the fruit actually, of the tree, follow the budding of the flowers and are also surprisingly small compared to the size of a mature tree, being no more than a half-inch in size. There are no problems with tree litter understandably, and so few animals are attracted to the Green Giant Arborvitae, perhaps because of this description. The Green Giant Arborvitae is recommended for growing as a hedge or privacy buffer along a property line, or driveway. Thuja Plicata, Western Red Cedars are ideal "windrow" trees. In a row, they'll truly diminish the wind. The Green Giant Arborvitae is justifiably considered wind resistant considering the windswept mountains of the Pacific northwest. The wood itself is weak, but it is very light. Green Giant Arborvitae trees are decay resistant, too, but the "Achilles Heel," the one and only vulnerability, is to being eaten by deer. Any Arborvitae are a favorite "deer browse," or as we jokingly say, "deer candy." The Western Red Cedar, the Green Giant Arborvitae do have better deer resistance than most arborvitae. Do not plant arborvitae too far away from structures, lights, roads, etc., where there's quietude and privacy for the "browsing deer." Now that you know all about 'em, Highland Hill Farm has at least 50 or more Green Giant Arborvitae in our nursery ready for pickup at any time. They will range from 1.5' to 12' and be balled and burlapped or potted. We also have field liners and seedling Green Giant available. 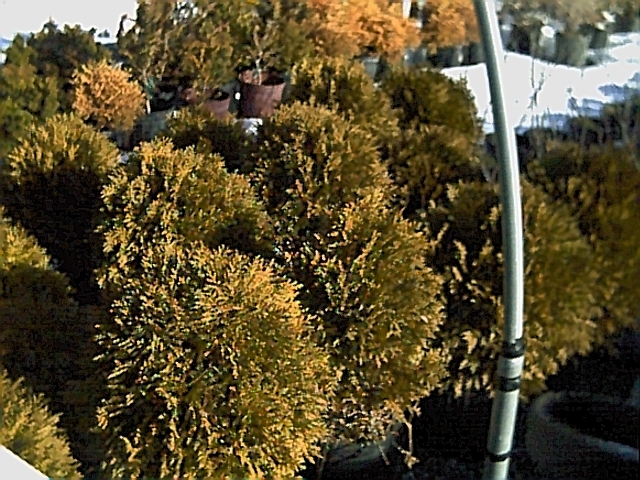 There are many more varieties of arborvitae available which we have in stock. If we don't stock the variety you want we will find it for you if possible. 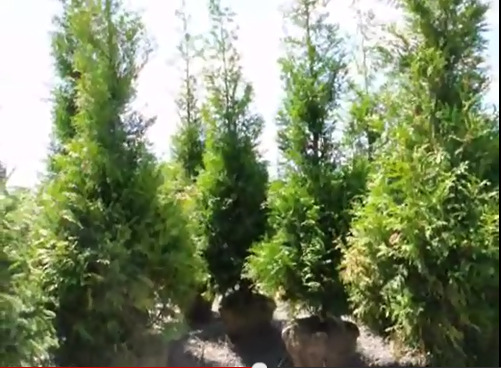 We also sell Arborvitae that are very similar to the Green Giants. One variety is called the Excelsa. It has bright green foliage,pyramidal in form, is fast growing. I believe it will reach 30-35'. The best exposure for this plant is full sun. It is cold hardy to -20F. This plant responds well to pruning and shearing. Its foliage color is retained throughout the year. For a hedge or a screen the plants should be spaced 4-5' stem to stem. A 10' screen needs only 2 plants. A 50' screen needs only 12 plants. 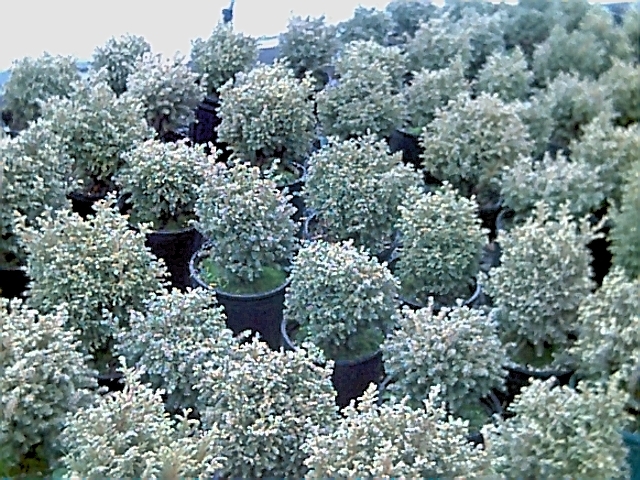 Other Arborvitae We Have - Were Ready To Load Your Truck! We May Also Be Able To Deliver and or Plant For You!! !